If you’re looking for specific budgeting tips which are aimed at families, simply continue reading to discover a few family-friendly budget tips, that you’ll be sure to use. While most families are able to budget for their monthly expenses, many families forget to properly budget for their yearly expenses. Examples of annual expenses which you should account for include school uniforms for each of your children as well as stationary and books for your children. If your children are enrolled in extracurricular activities such as sports teams, professional music lessons or dance classes, make sure to budget each month for all of your children’s extracurricular activities. As well as budgeting for fees or lessons also make sure to budget for any equipment which your children may need as well as any trips or camps which may be associated with their activities! Also, make sure that you have an emergency savings account which, you can access if you need to purchase a new car or repair your car or perform routine maintenance on your house. You may want to budget for one family outing each week. Where you’ll treat your family to a trip to the movies or your local swimming pool. Or to play mini golf or go bowling together. You may even want to alternate the activities which you pick each week. If you plan out each family fun day, you’ll be able to preset your budgets. As an example, if you plan a trip to the circus, you’ll be able to give each kid a set limit on how much they can spend on snacks and merchandise. Instead of freely letting your kids spend way more money than is logical. On the days which aren’t marked as family days out, you can still go out as a family. Just try to make the most out of the free activities and attractions which are on offer in your town or city. As an example, you may be interested in spending a sun-soaked day at your favorite beach as a family or packing a picnic lunch for a family walk. Some kid-friendly museums even offer free tickets on certain days of the month. 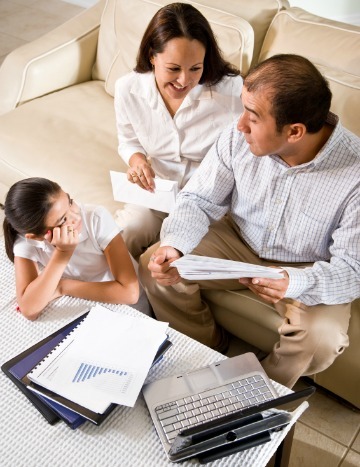 Make sure to budget to be able to give each of your kids a little pocket money. Which they’ll be able to use in order to start to learn budgeting skills. Don’t be tempted to overspend at your local grocery store. Instead, make a detailed shopping list and make sure to stick to it. Or give each member of your family a small amount such as $5-$10 which they can choose to spend on a luxury item. If you follow the seven rules listed above, you should have no problems setting a family budget.